I’m not a big fan of most wrapping paper created for kids. Emblazoned with trademarked characters from movies and television shows, I find them all rather tacky. Typically I will opt for bold colours and fun patterns — something kids will like but that is not an assault on my own aesthetic sensibilities. This vibrant DIY wrapping paper made using a colourful combination of tapes is a perfect solution. The half-and-half dot looks more complicated to create than they are and add extra fun to the confetti pattern. It’s like a party! Read on for the full tutorial. 1. Wrap your box. Cut your paper to size, then wrap it around your gift and secure in place with Scotch® Permanent Double Sided Tape. 2. Make the dots. Apply a strip of Scotch® Expressions Washi Tape, Pastel Blue Solid, to the parchment paper. Take a strip of another colour — Scotch® Expressions Washi Tape, Techno Blue – tape it to the parchment paper, slightly overlapping the first strip – the overlap will help the two pieces stay together when you remove the tape from the parchment paper. Repeat with all the colour and pattern combinations you’d like to include. I also included dots of solid Scotch® Expressions Washi Tape, Techno Pink and solid Scotch® Expressions Washi Tape, Techno Blue. Once you have your strips of tape prepared, position the 3/4” circle punch so each tape fills half the circle; punch a hole. Repeat using both the 3/4” and 1” circle punches until you have enough dots to cover your wrapped gift. 3. Apply the dots to the paper. Gently remove the parchment paper from the back of your first dot and stick to your wrapped gift (Begin peeling up from the tape that is underneath, so the two halves stay together). I applied my dots in a loose, random arrangement, mixing colours, patterns and sizes. 4. Add the final touches. Once you’ve finished sticking on the dots and are happy with the design, tie a ribbon around the gift and attach a gift tag. EXPERT TIP: Choose a white or light coloured paper in which to wrap your gift. It will allow the colours of the tape to pop. great idea Corinne! 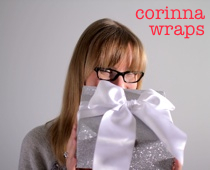 i love reading about your gift wrapping ideas!